There has been a call to examine whether or not people forgive in the way that has been conceptualized in the literature (Rye et al., 2000). This issue was addressed using Q methodology to examine participants' perspectives on their experiences and their ideals of forgiveness. Thirty community members (20 women) ranging in age from 25 to 68 participated in this research, which involved sorting 66 statements about forgiveness according to the level of agreement with each statement. 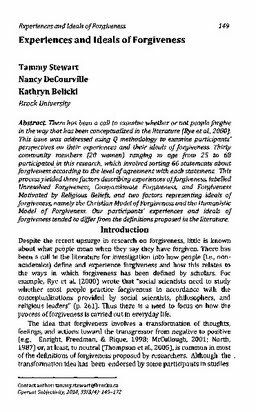 This process yielded three factors describing experiences of forgiveness, labelled Unresolved Forgiveness, Compassionate Forgiveness, and Forgiveness Motivated by Religious Beliefs, and two factors representing ideals of forgiveness, namely the Christian Model of Forgiveness and the Humanistic Model of Forgiveness. Our participants' experiences and ideals of forgiveness tended to differ from the definitions proposed in the literature.